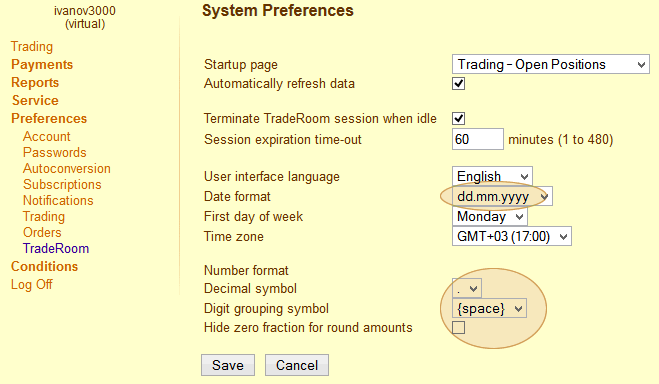 This main menu section contains the functions meant for the TradeRoom preferences management. Here, you can change some of your registration data, passwords for the TradeRoom access via the Internet and phone, subscribe to the Forexite news and analytic delivery, adjust notifications of your account events by e-mail, change the trading and order placement preferences. Some of the preferences have been reviewed above, so let’s have a closer look at the rest of them. While trading the different instruments, you get a profit (or loss) in different currencies. To simplify the profit/loss tracing, all balances are converted by default into USD. The operation is performed with a conversion spread. If you want the balances to be converted into another currency, you’ll have to change the settings on the "Balance Automatic Conversion" page. 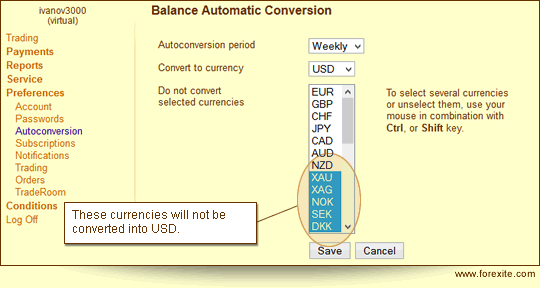 If you do not need to convert the balances for some of the currencies, you can disable the automatic conversion of the currencies you select. However, in this case a lot of different currencies will be accumulated on your account. The automatic conversion is usually disabled for the currencies used for the funds transfers to and from the account. Thus, you save on the conversion. The picture below shows the Forex and conversion preferences. You can switch between the trading styles in the "Quick Settings" group. The switch allows for the default settings according to the selected trading style: display of the deals in the open positions list, a possibility to have open opposite deals, and the the operations with the orders offered after a deal. You can also change all these settings separately. 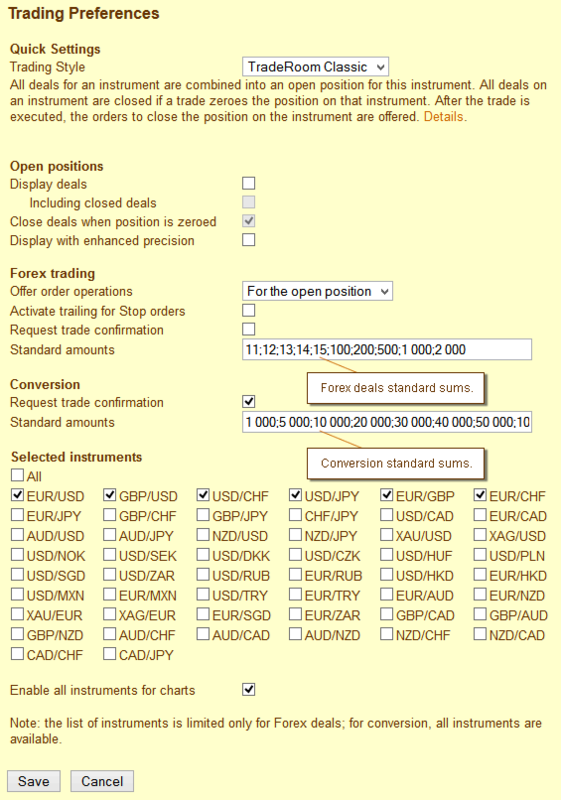 You can create your own list of the amounts which will be used for the quote requests for the Forex and conversion trading in the "Standard amounts" field (see the picture above). You can edit the list as you wish: modify it in any way, delete or add any amounts including even non-round amounts and fractions. 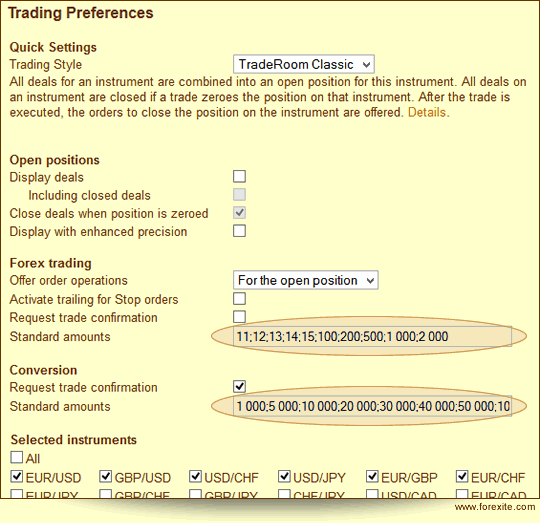 You can disable the currency pairs you do not use for trading in the "Selected instruments" group. The disabled instruments will not be thus displayed in the instrument list. You will use only the marked instruments. For the conversion deals all the instruments are available. 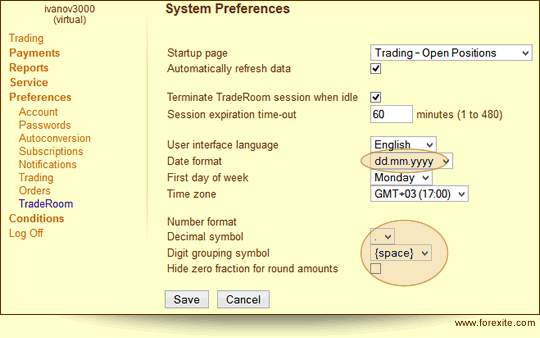 We’d like to draw your attention to another useful feature of the TradeRoom trading system. Many competing trading platforms have the time, the date format and that of numbers preset on the company server. TradeRoom is different. You can choose the date and the number format you are used to, on the "System Preferences" page.